I’ve Died And Gone To Cycling Heaven. Welcome To Denmark. Although I have traveled to over 40 countries in the last 20 years somehow I missed Denmark. Last year I ended up committing myself to the smartest and most beautiful woman I had ever met in the middle of Cayuga Lake with about 150 people on standup paddleboards and kayaks. My partner Thilde also just happens to be Danish. Denmark is the undisputed biking capitol of the western world. In the city of Copenhagen over 50% of its citizens commute to work. Not because they have to because they are dirt poor like in many third world countries, but because they chose to. Why would any sane middle class citizen chose to ride their bike to work instead of drive a car? Two things: Culture & Infrastructure. Danish people are some of the happiest in the world and its quite evident everywhere you look. People are pleasant to talk to and seem to smile frequently and genuinely seem to care about each other. They also seem to promote and encourage a culture of cycling. I was completely shocked the first time I saw a bunch of bicycles sitting on the bike path bunched together waiting for their bike-only stop light to change without any other vehicular traffic coming. In New York that would just never happen. In the US bikes seem to fill up the empty spaces that the cars leave behind. We end up weaving in and out of cars, running red lights when we deem it is safe to do so and dangerously passing cars on either side that are sitting in traffic. This sets up for a lot of friction between automobile driver and bike commuter. It’s not the slightest bit uncommon for me to get yelled at by drivers when I’m biking and its not uncommon for me to yell at drivers who try to run me off the road or cut me off. It’s just a bad scene all around ripe for conflict and an accident waiting to happen. 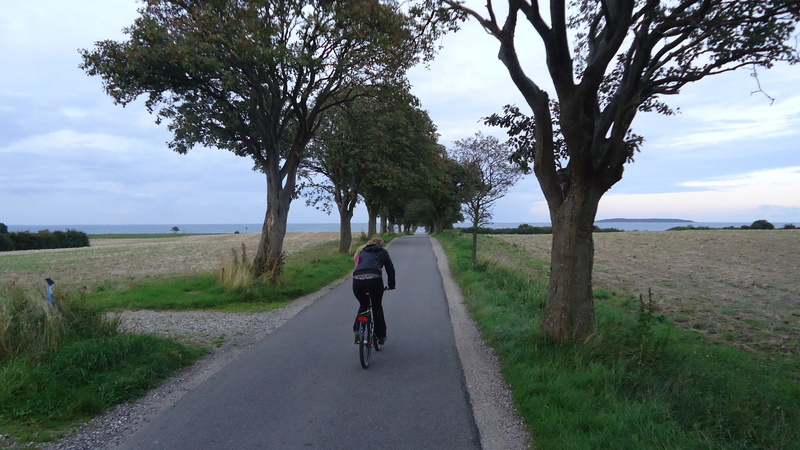 Every intersection in Denmark is filled with bicyclists and there is almost no chaos. There is usually a small 1 inch increase in the height of the bike lane with a small inlaid curb between the road and the biking lane. Thilde’s father Lars was the Constable of the Police department in Odense for many decades told me it was important to have the bikes close to the cars so that the cars were aware of them. You need to create tension between the cars and the bicyclist, but the key was getting the amount of tension right. The bicyclists get their own stop lights which are much smaller than the vehicular traffic lights and have pictures of bikes superimposed on them. In large roundabouts and at road crossings the bike lanes are painted blue and drivers actually actively look for bicyclists before turning to make sure they don’t hit them. In Denmark if a car hits a bicyclist it is assumed that the car was at fault, the exact opposite of America. I have never seen an American driver actively looking for bicyclists. It is really is part of their cycling culture. What I did see was busy roundabouts with more bikes in them than cars and everyone getting along just fine. Most Danish bikers (over 95%) don’t even wear helmets. 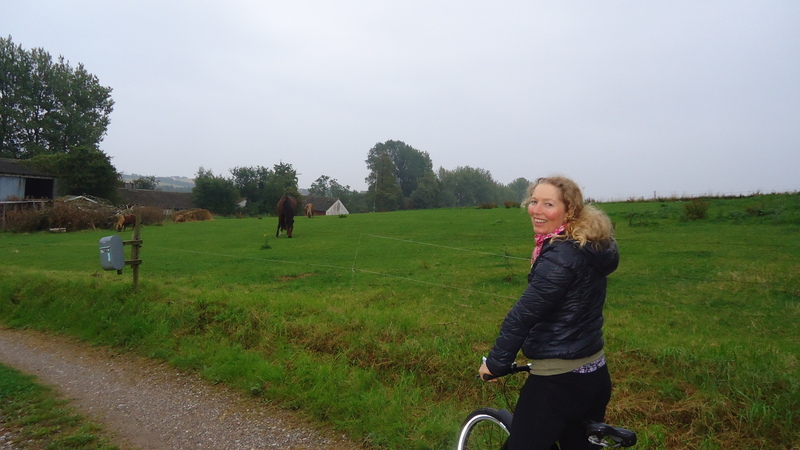 I have been hit by cars 3 times and I always wear a helmet when riding, but I felt that a helmet was totally unnecessary when biking in Denmark. 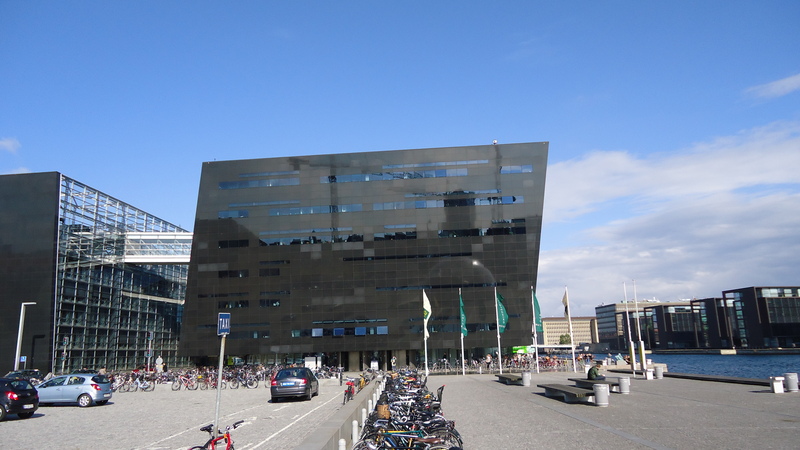 Many buildings in Denmark are literally surrounded by hundreds of bicycles. So what do we have in America? In my hometown of Ithaca they are simply too cheap and refuse to build bike lanes even though the streets are filled with bikers on any given summer day. They are building the first ‘real’ bike lane on Cayuga Street and it looks like they are talking about putting up ugly vertical plastic dividers between the bike lane and the main traffic lane. Whoever is designing this thing should come to Denmark and have a look around, they could learn a thing or two. Another shocking discovery was the proliferation of Internally Geared Hubs. I’ve seen hardly any IGHs in NY for whatever reason. My guess is that people in NY look at the derailleur as a necessary evil. 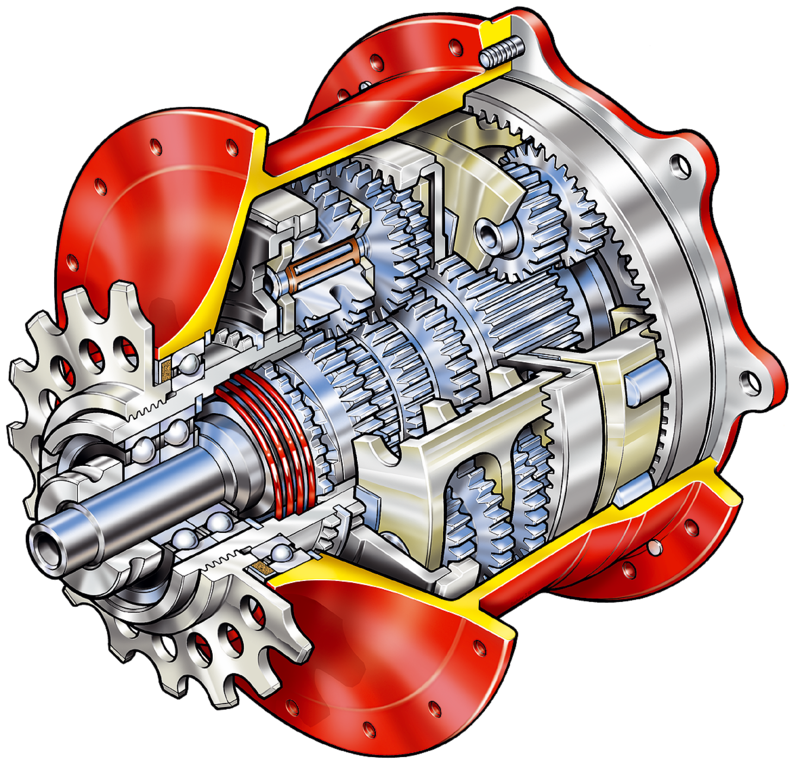 It could also be that Americans are just too cheap to spring for an IGH which can run $200 for a 3 speed hub to over $1400 for a 14 speed Rohloff IGH. 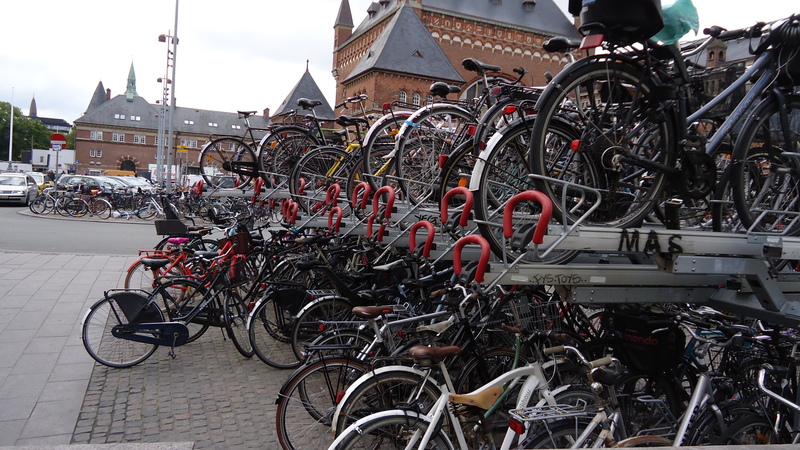 Danes seem to really enjoy having bikes that just work all the time without having to adjust their derailleurs. The IGH also allows you to shift the gears while not moving the bike which is convenient at stop lights when you are in the wrong gear. They also don’t seem to mind having bikes that are a little heavier than they need to be for convenience and safety. There was also a proliferation of Roller Brakes everywhere I looked. I had never even seen a roller brake before in the states and almost every bike in Denmark had one. Apparently they require very little maintenance and work well in all kinds of weather. They do have a hard time disappointing heat on the long downhills, but on the bikes I used they worked about as well as you would expect bicycle brakes to work. No batteries and no need to turn it on or off. 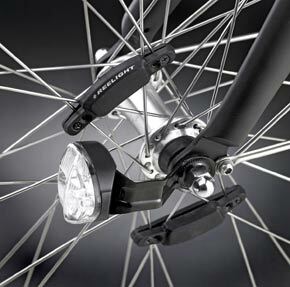 Many bikes had permanent safety lights on the front and rear that were completely sealed and worked without batteries. They were powered by clipping 2 magnets onto the spokes and then the force of the wheel spinning around would power the blinking LEDs. Another system that I had never seen in the US on any bike but is ingenious. A small steel bar goes through the spokes to keep the wheel from turning. 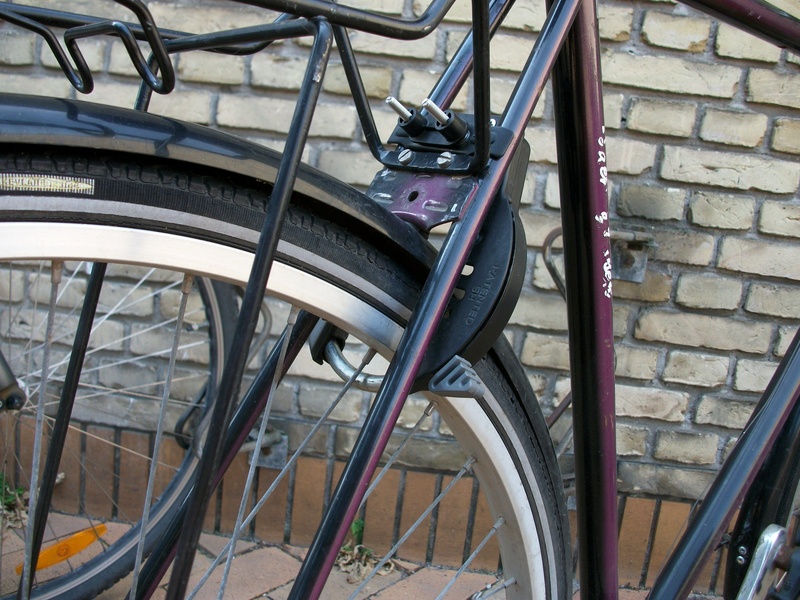 Over 95 % of the people in Denmark (except in Copenhagen where about 10% of the bikes were locked to stuff) do not lock their bikes to things and instead use a simple bike lock device that simply sticks a large piece of metal through the spokes of the rear wheel. It was a very simple solution to the very real problem of not being able to find something to lock your bike to. Now that they have cut all the parking meters off in Ithaca I’m sure the problem of finding a place to lock up your bike is going to get even worse. The idea behind locking the wheel is that it is so inconvenient that thieves won’t waste the time to carry your bike back down the street. They would look awfully suspicious carrying around a locked bike. I expected ebikes to be everywhere in Denmark but I was wrong. The only people I could see using ebikes were people over 70 and some people pedaling 3 wheeled cargo trikes. This is probably because of the wimpy 250W European power limit as it doesn’t make a whole lot of sense to spend the extra money on an electric bike for so little power. Almost all the ebikes I saw were also mid-drives which is the best application of power on a low power ebike. 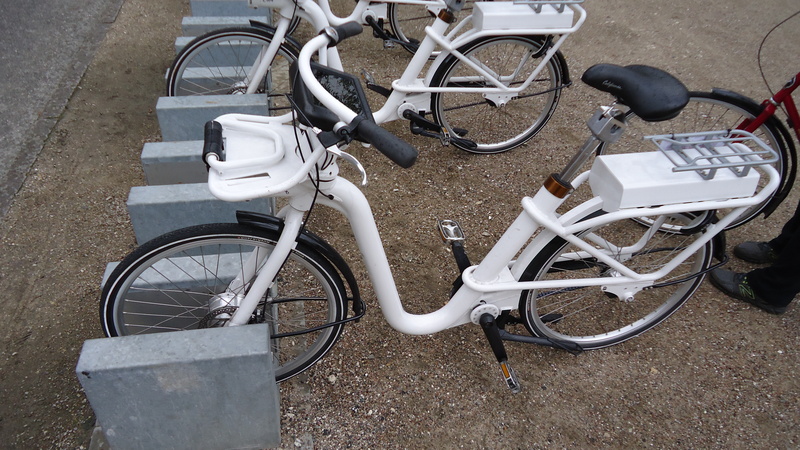 Electric bikes are available all over for about $3.50/hr and can be left at any kiosk after use. These were not very popular and were very heavy. As the US mail system continues to struggle to stay self-funded here is a radical idea that would save an incredible amount of money on the mail system’s primary expense. 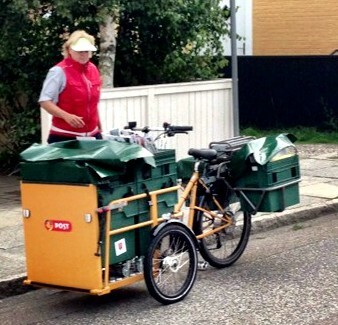 Have all mail delivery happen with electric bikes. The Danish Post bike is driven by what appears to be a 1000W geared hub which is much larger than any other ebike motor I saw in Denmark. The mail carriers would move the bike from stop to stop then get out and deliver the mail to the current stop. The frame as a very nice step through design and the cargo trike they used looked like it could take about 800 lbs of weight (including the rider). Load these bikes up with lithium batteries and you should be able to handle most US mail routes at pennies on the dollar for what the US mail system currently spends on their mail vehicles. When doing urban planning the city planners make a conscious effort to keep the city center free of all automobiles and trucks. This allows for a much more densely designed city center with long sweeping pedestrian malls. Businesses that require regular deliveries by truck like restaurants and larger retails stores are around the outside ring of the city center and at the very core businesses like museums and theaters are more common that require less delivery traffic. With their own traffic signals traffic can flow so much smoother than if the bicycles are pretending to be cars. Bikes also do not do left turns cutting through often several lanes of car traffic, instead the signal for a stop and pull off to the right to wait and cross the street with the traffic light. Left hand turns are incredibly dangerous on bikes as not only do you have to deal with all the traffic you have to cut across you often have to deal with several lanes of oncoming traffic while sitting in the middle of a busy intersection. 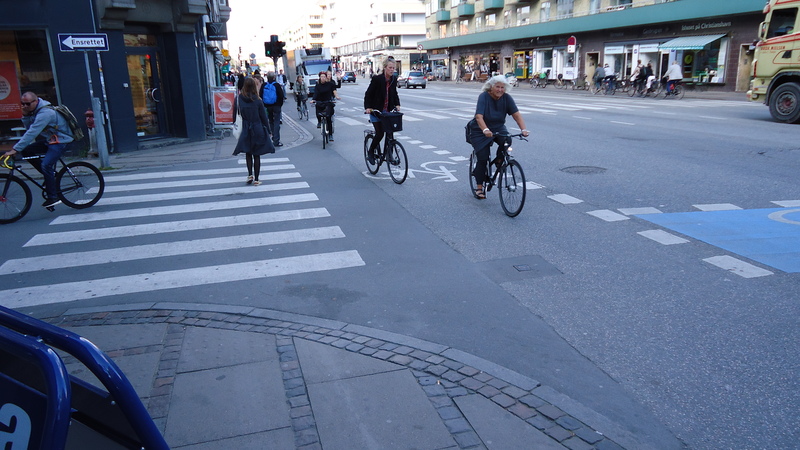 The way the Danes deal with it is much better and essentially eliminates all left hand turns. The hardest thing for drivers to do is to remember to look over their right shoulder for bicycles going straight when making a right hand turn. The law is that bikes must have lights at night, many of the bike lanes are lit by street lights. What better place to invite bikers than right through the city center. On most of the streets that are designed to gather people there are narrow bike lanes that run through the center of the street while the sides of the street are filled with merchandise flowing out of the stores and outdoor seating for restaurants. 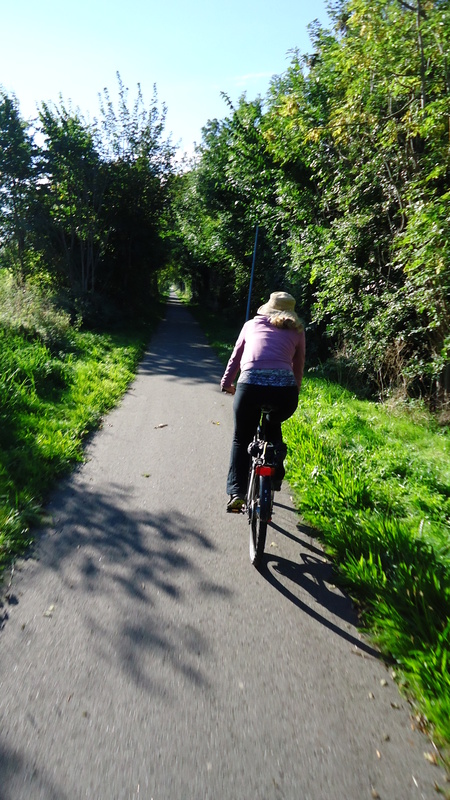 The spaces are wonderfully designed with bikes zipping back and forth through the middle. A good city design invites people on foot and on bicycle into its heart. Yes you read that title correctly, in Denmark they actually close down their busiest roads in the city centers and build buildings in the middle of the street. At first this seems like complete madness, but it actually makes a lot of sense. They are making a conscious choice to keep vehicles out of the city center and instead are opting for density and bike lanes. Our home city Ithaca, NY considers itself very liberal because it has a pedestrian mall that is 2 blocks long and 2 blocks wide in the city center for a total of 4 blocks. In Odense which is similar in population to Ithaca the city center comprises of almost 25 square city blocks, all almost entirely without auto access or parking. It is far more attractive to spend time in a city center that is without cars and pollution and tastefully designed to appeal to both tourists and locals alike. In the country there are rural bike lanes everywhere where cars are not allowed. Every bike I saw had a tiny bell on it and the people riding bikes never seemed to mind ringing the bell to warn pedestrians that were in the way or about to collide with them. Where you would normally have a 5′ wide sidewalk in NY 2.5′ of the sidewalk in Denmark was for bikes (travelling in one direction only) and the other 2.5′ was for pedestrian traffic. The amazing part is that you can fit a lot of people in a 2.5′ section of sidewalk and most pedestrians were very aware of the bikes and the bike lanes so I did not witness any biker\pedestrian collisions when I was there. These double-decker bike racks double the amount of bikes you can store in a given space. This is a startling contrast to Cornell University where I saw many collisions between bikes and pedestrians in the 5 years I spent on campus. The bikes have no bells, the sidewalks were mixed use for bikes and pedestrians and the pedestrians ignored the bikes until they got rammed by them. In the end Cornell had to create separate dismount zones where people were expected to get off their bikes and walk them under threat of getting ticketed. In my opinion this was a sub optimal solution that showed very little planning and foresight. Cargo bikes filled with children were everywhere. There were tons of parents that pedaled large cargo bikes with one or two kids in the front. Often the children were quite heavy (almost 100lbs each). The amazing thing was that most of these child carrying bikes had no electrical assist, they were just geared very low. 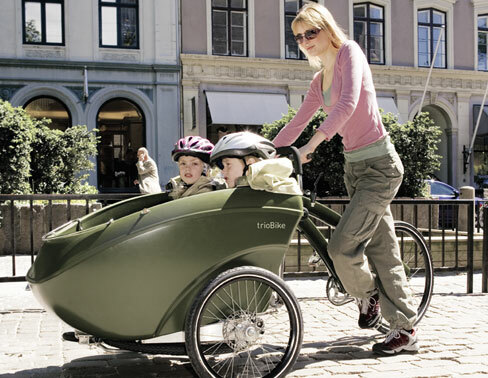 The other thing I saw was parents riding around in the heart of Copenhagen with their young kids riding next to them. This is something that you would absolutely never see in a large US city, it’s just too dangerous. Pedestrians look both ways when crossing bike lanes and so do drivers. No one parks their cars in the bike lanes or blocks them with construction cones. When there is a construction zone where automotive traffic is diverted the bike lanes are diverted as well often with large concrete barriers to protect the shifting traffic from hitting the bicyclists. Here is a great video of Casey Neistat running into a whole bunch of obstacles on bike paths including a NYC cop car, the good stuff starts at 1:30. The hardest thing for pedestrians is to remember to do is to look both ways when stepping out onto a bike path, but it seemed like all the Danes were well versed in this. 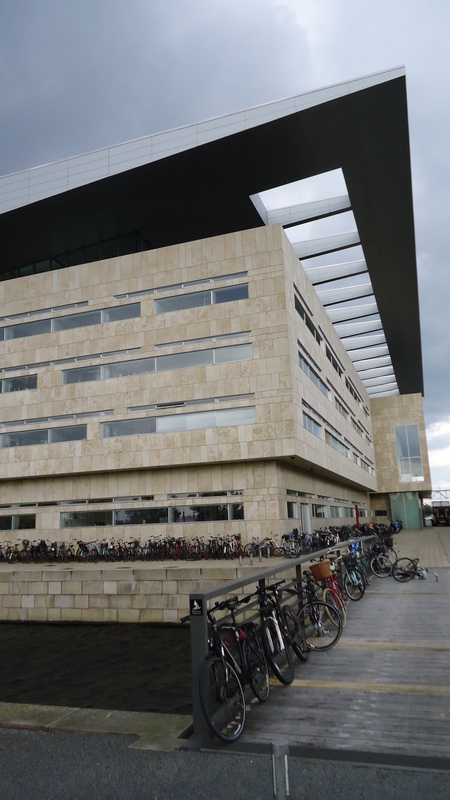 Fantastic architecture and a wonderful cycling infrastructure are two things the Danes excel at. Bicycles solve a lot of transportation problems as well as helping to curb global warming. 50% of Copenhagen’s residents bike commute to work. Imagine what a different place NYC would be if 50% of its inhabitants rode their bike to work. The problem is that the way American drivers deal with cyclists and cyclists deal with cars that it will never happen. City planners look at how to spend their curbside currency and when it comes to making decisions about cars vs bikes and the cars always seem to win out even though they take up a lot more space and are incredibly dangerous. It is a horrible waste that so much of our urban footprint is used up with roads and parking spaces designed for cars. The average car sits idle over 90% of the time and a decent skinny tire road bike can easily go 15-20 mph on level ground with a fit cyclist. The fastest cars are allowed to generally go in a city is 30 mph and often much slower than that so you are paying a massive premium and using up a huge about of space and infrastructure to gain a few mph of speed in getting from place to place. With the added convenience of not having to find parking and bike right to the door of where ever you are going bikes are a clear winner in the competition for urban transportation. If you want your city to support bicyclists then the easiest way to start is to start biking yourself. The more bicyclists a city has the harder it is to ignore the lack of cycling infrastructure. Get active in your local community planning meetings. Speak up and be heard and work as hard as you can to promote cycling in your own community. Hello! Thank you so much for writing an article about these topics. It’s so interesting! Some of these are definitely cultural, such as what we accept for street facilities here, while some of them are likely price and availability. 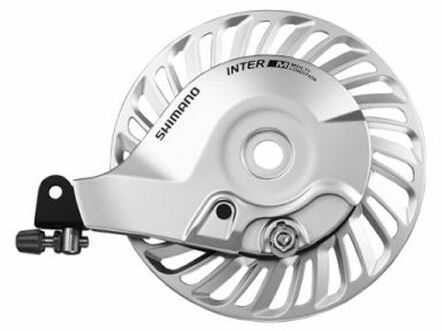 I would love to get an internal hub but I don’t think I’ve ever seen one–certainly not for sale at the LBS. A couple of things to note are that Ithaca has TONS of BIG hills. So many major places to go are up their own separate Hill. Cornell. The Hospital. Ithaca College. eBikes are a game changer for people to get to these places and drive fewer miles. I think we need to promote them instead of telling people they are just for the elderly. Parking meter poles have not been removed in Ithaca (despite the claim) though many of them will be. Others will have hitching post bike racks installed. There are a few bike lanes around Ithaca (Old Elmira Rd, E MLK/E State St to Mitchell & Ithaca Rd; Prospect St contra-flow) Cayuga St is not the first “real” bike lane. Please keep writing about bicycle promotion. See you in the streets! The heads of all the parking meters within several blocks of the commons are all gone. A headless meter is a pretty dumb place to lock your bike to. I’m glad they are turning some of them into bike racks, the racks all around the commons are always full. There is just not enough. There are other bike lanes but they are short and sorely inadequate and added as an afterthough if there is an extra 3′ on the road that they don’t seem to know what to do with. The bike lanes generally only run a block or two, honestly it’s pathetic. After riding 100km in Copenhagen with bike lanes on every street you begin to realize how inadequate most US cities are. They have been painting large bike images with the word BLVD under it. To me it’s just a bad joke. As if somehow painting bikes all over ithaca in the middle of the roads is going to keep people from yelling and honking at bikers and trying to run them off the road.